From one of today's hottest novelists and author of the bestselling The Middlesteins -- a provocative story about friendship and self-discovery. Catherine Madison left her small town in Nebraska after her husband deserted her. She's also left behind her most shameful secrets-of a family and a marriage that have plagued her with self-doubt. On the road, she's trying to become a new person. But running away from the past isn't as easy as she'd hoped. Her journey leads her to Las Vegas, where she forms surprising new friendships that compel her to reveal what she'd sworn she'd keep hidden, and teach her what human connection really means. 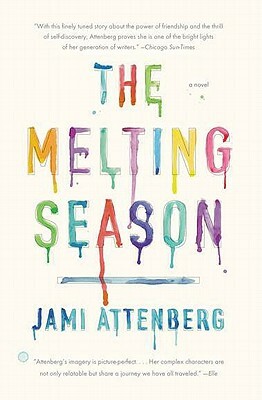 "Attenberg's narrative voice - a lean, straight-ahead, deadpan tone that cuts cleanly through Catherine's hypocrisy and self-pity like a laser-guided strike - makes The Melting Season singular and disquieting." "A rich novel, one that begins as a road-trip yarn but then contains enough twists to form a complicated emotional journey." "Attenberg's imagery is picture perfect and, many times, tragic.Her complex characters are not only relatable but share a journey we have all traveled: leaving home and discovering for the first time who we really are and where we belong." "With a trail of whiskey and Diet Cokes in her wake, Catherine heads west to leave behind a damaged marriage. Reading about her life in Vegas and her road to self-discovery in this novel feels like peeking at a friend's diary." "Attenberg is a brave, honest writer with scary talent, and this novel about a young woman heading west to escape a failing marriage and a small town is her best yet." "An intelligent, moving portrait of a journey to self-awareness, with meaty characters and a refreshing absence of psychobabble." "[Attenberg] renders poignant prose and portrays the desperate behavior of her characters with verve." Do you think Catherine should have kept Thomas’s money? Why or why not? Do you think Valka was more justified than Thomas in getting plastic surgery? Why or why not? Do you think Catherine and Jenny should still try to have a relationship with their mother? If so, what kind of boundaries should that relationship have? Catherine could not open up about the sexual problems that plagued her marriage until she met the brash Valka, who talks easily about her own problems. Are you more like Catherine or Valka? Whose approach do you think is better? What parallels can be drawn between the end of Valka’s relationship with her fiancé, Peter, and the end of Catherine’s marriage to Thomas? Catherine fell in love with Thomas when she was sixteen, before she had seen or known very much of the world. How do you think things will be different the next time Catherine falls in love? Catherine left her home in Nebraska behind so that she could discover something about herself. Have you had the same desire to leave something you’ve known for something new and different? Did you act on it? If no, why not? And if yes, what did you find? Why do you think Catherine was not curious about life outside her hometown before her marriage ended? What do you think Jenny’s daughter Laura’s life would have been like if they hadn’t left Nebraska? Do you see a brighter future for Laura in California? Why or why not?